In our ever growing fast-pace business world it is imperative that the business community have a work force that is completely armed and capable of meeting the demands of its customers by becoming more Flexible in every facet of their work. This means having current policies that enumerate the needs of customers, procedures and practices that are reflective of their customers experiences, and having an attitude that produces a “can-do” behavior willing to exceed the basic interest of their customers. As proof that inflexibility is harmful, not only to the creditability and image of a business, but also to customer relations, I had an experience in a restaurant that was insensitive and disturbing. After arriving at a well-known restaurant, my guest and I were cordially greeted and seated by a host. After taking inventory of the attractive surroundings, I noticed a customer across from me had a salad sprinkled with fruit. Not wanting a salad, I had a desire to have a serving of fruit with my lunch. I asked our server if I could just have a fruit bowl option with my meal. The server kindly responded that the restaurant did not have an individual fruit option on the menu. I acknowledged that I understood that, but requested if he could make an exception because, I knew the person across from me had a meal that included fruit in it. So, I politely pointed it out to the server that the customer across from me seemed to be enjoying food that included fruit. But, even after pointing this out to the server, he emphatically stated again that he could not grant my request because a fruit option would violate company policy. Being totally upset with his rigidity and inflexibility to what I thought was a reasonable request, I abruptly, along with my guest, got up and left the restaurant in total disgust. Later in the day, I called the restaurant management and shared my disappointment with the server’s insensitivity and level of inflexibility. The next day, I received a call from management stating that their policy had been modified and procedures and practices had been changed, which gave their servers more opportunity and responsibility to accommodate reasonable request from patrons. Wiki highlights the importance of improving service quality for customers. A number of businesses are shifting their thinking, realizing they needed current programs and practices that reflected the interest of their customers. Improving public perception means listening to the voices of their community members and dismantling out dated policies and practices that are rigid and Inflexible. Improving public relations and organizational creditability may require installing new systems, replacing old habits, and poor training models. Hundreds of businesses across the country are now training their employees to be more aware, sensitive, responsive, and Flexible in meeting the needs of their customers. Since this momentum shift, I have ascribed to a more customer-centered model that encourages businesses to include their employees in business decisions. The voice of employees matters because they are the vanguards, who have a significant role in protecting the interest of the business, and are expected to ensure that customers are given excellent customer service. Evidence has shown employees, who have leadership’s support to exercise solid judgment and Flexibility, are more productive and have a higher level of job satisfaction. Being inclusive by respecting their person helps to improve morale, attitudes, and organizational loyalty. Additionally, having everyone on board and on their game in a highly competitive market place requires the team to be fully educated, knowledgeable, trained, and Flexible in responding to the needs of its customers. Current business models, such as, 8 Rules for Good Customer Service suggests by having training programs that emphasizes and support a customer-centered model supports a business culture that is transparent, receptive to change, and adaptive to the complex and Flexible needs and expectations of its customers can scale to unlimited heights of success. The bottom line is this, for a business to flourish and profit, it is important, from top to bottom, that the business membership have policies and procedures that are congruent with standard business practices that ae in the best interest of their customers. The customer’s experience should not be rooted in only having one option to consider. The lack of Flexibility in an organization can cause grid-lock, confusion, and lack of confidence between management and employees., along with austere dissatisfaction among your customer base. 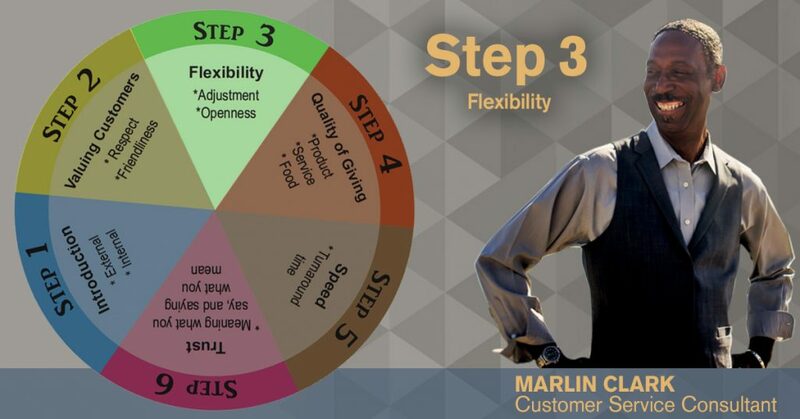 By being Flexible a business can adapt and adjust more easily to its community needs and rise above its competition, who is ill prepared in meeting the complex needs and expectations of its customers. Understand this, once you know what woos your customers, you will not only highly satisfy them, but keep them coming back for more.